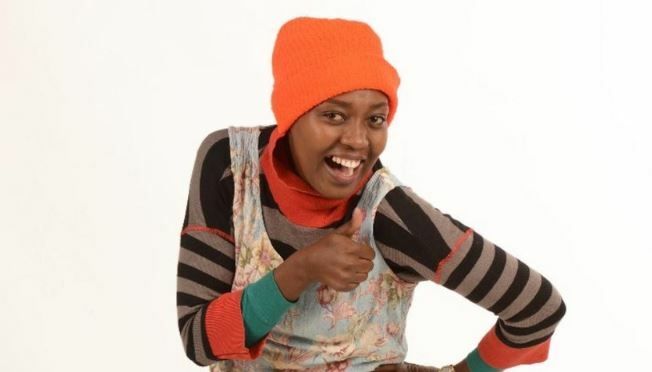 For all her talent, sense of humor, and brilliant acting, ‘Auntie Boss’ actress Nyce Wanjeri is beginning to gain recognition beyond the Kenyan borders. Wanjeri, who plays a housegirl named Shiru in the hit comedy series, has been nominated for the Africa Magic Viewers Choice Awards (AMVCA). Wanjeri will battle it out with big names in Nollywood including Rita Dominic and Adesua Etomi. Wanjeri talked to Buzz about humiliations, triumphs, and why she thinks #MeToo can never work in Kenya. Read her inspiring story below. I was overcome with emotions when I found out I had been nominated for AMVCAs. I cried because this is a big deal for me. I never thought I would have been nominated for the best actress in series/comedy, not just in Kenya but across Africa, alongside big Nollywood names like Rita Dominic and Adesua Etomi, who I used to watch when I was in high school; win or not, it is an honor. This will be my first trip outside Kenya, I can’t wait to be in Lagos. Life was not easy when I was growing up. I started acting in primary school but there was no exposure at all; you know how the “ushago” schools are. We never wore shoes when going to school. Some people at the Catholic Church I used to go discovered that I had talent and confidence from the acting we did at the church. While in Form Three, I started doing poems. My school never had a good drama club but the poems did very well. I was the first one from Komothaiga girl’s school to appear in a newspaper associated with drama and poems. We did not have money to take me to college. My mother talked to my cousins who lived in Umoja estate, Nairobi, so that I could come and stay with them. Every time I talked to them, they would say that I was funny and they encouraged me to join the theatre. But I didn’t know how where to start. I was still new in Nairobi, I didn’t know anything or anywhere. Luckily, my cousin’s boyfriend had a brother who used to act set books at Kenya National Theatre, so she introduced me to him. My first audition was not good at all. One of the judges said that people with such “nice” names are the ugliest and their parents are trying to hide their ugliness. I was so angry. Thank God I was given a scenario that required me to be angry. And with that I landed my first set book role which I did for three years. Giving birth while still young and new in the industry was not easy. I had to carry my daughter who was still very young to the theatre. I would leave her with my husband as I went to do my scene and vice versa because we worked together and we couldn’t afford a house help back then. My first role in television was in KBC’s “Merimela’s House”, with my daughter when she was just four months old, in 2013. I got the role of Shiru in “Auntie Boss” while I was under Johari and Fanaka Arts. One of the founders of Moon Beam, who used to love the Kikuyu plays we did then, called and said that she needed me in her auditions. When I got there she asked if I had read the script she had sent me which, I had no idea of. I asked for a hard copy of the script to go through quickly. They all laughed throughout my audition. Three weeks later they called and told me that I had landed the part. I think people would still relate with me even if I took on a serious role. I normally say that everything has its own audience. There will be people who will see me as Shiru and say that I exaggerate things and there are those who will see me as that serious character and appreciate it. It is difficult to tell whether I would choose theatre over screen time or vice versa because they are two different things. I love TV because there are so many emotions that you can portray. I love theatre because there is always an immediate reaction from the audience. That is why I still do both. I am a big advocate of the #MeToo movement in Kenya because I have talked to different people, both male and female, and they all say the same thing; there are people known for solicitation of sexual favours in the acting industry. There are also some bosses who are harassed by actors who know their secrets in exchange for roles. You do not have to give anything to anyone for you to land a job. In Kenya, the movement cannot work because if I were to expose my boss, all the producers would be against me and I would never land another role in Kenya. So most people prefer to keep quiet and take what they get because acting is what brings food on their tables. As humans, even in our lives we have to act in front of the fans, sometimes on social media. We have to show them where we came from and what we have achieved. I never used to wear shoes when I was young and now I can afford some. If we do not do that, we might lose them because they expect us to live in a certain way. Sometimes, we might have hired the clothes you see us wearing to audition for roles. One day, I used public transport from up country. The matatu was full but the tout told me a passenger was alighting at the next stage. So he gave me what they call sambaza. One of the passengers recognised my voice and asked why I was using public transport yet they watch me on TV. She asked me why I don’t have money. I was left speechless. I teared in that matatu. Wah, wacha nikuambie, hii industry haina pesa, (Let me tell you, there is no money in this industry). I love acting with all my heart, every day that I’m not acting, I think I would die. My husband and I have been together for nine years but he is yet to propose. I’m that kind of a woman who would love to have a big wedding and be picked from our home. It is up to him; if I said I wanted a wedding today, will I marry myself? In the future, I would love to have two more kids God willing.